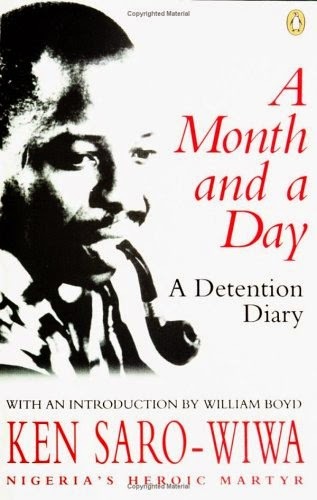 A Month and a Day is a non-fiction that narrates on Ken Saro-Wiwa's illegal detention in 1994. Though, he was released, however, he was detained again in 1995 and was executed by the Nigerian military dictatorship. Ken Saro-Wiwa was a Nigerian writer and television producer, however, he was famously known as the founder of the MOSOP (Movement for the Survival of the Ogoni People). A social non-violent movement created to give voice to the Ogoni people whose environment has been completely devastated by the oil companies (notably Shell and Chevron) mining in their land. And all this happening to a people whose home is one of the richest in Africa. Over the past thirty-two years Ogoni has offered Nigeria an estimated US thirty billion dollars and received NOTHING in return, except a blighted countryside, and atmosphere full of carbon dioxide, carbon monoxide and hydrocarbons; a land in which wildlife is unknown; a land of polluted streams and creeks, of rivers without fish, a land which is, in every sense of the term, an ecological disaster. High-pressure oil pipelines crisscross the surface of Ogoni farmlands and villages dangerously. This is not acceptable. Oil pollution is a great menace to the Nigerian environment. I wish to warn that the harm being done to the environment of the Niger River delta must be ameliorated by the oil companies which prospect for oil there; the degradation of the ecosystem must end and the dehumanisation of the inhabitants of the areas must cease and restitution be made for past wrong. We cannot sit idly by while we are, as a people, dehumanised and slowly exterminated and driven to extinction even as our rich resourced are syphoned off to the exclusive comfort and improvement of other Nigerian communities, and the shareholders of multinational oil companies namely Shell (Dutch/British) and Chevron (American). Needless to say that the Nigerian military dictatorship under Babangida wanted his head on a plate. Unfortunately, they succeeded. So today, I re-dedicate myself to what has always been my primary concern as a man and a writer: the development of a stable, modern Nigerian which embraces civilised values; a Nigeria where no ethnic group or individual is oppressed, a democratic nation where minority rights are protected, education is a right, freedom of speech and association are guaranteed, and where merit and competence are held as beacons. Convinced that most Nigerians share this concern, I will stand for it at all times and in all places. This book provides an interesting insight into the creation and development of MOSOP, along with a good understanding of the structure of the Nigerian government of that time. It mentioned the names of some people I already know, for instance Chinua Achebe, Wole Soyinka and even Late Festus Iyayi whose death I announced some weeks ago. Click here. He was also a threat to the system and they wanted his head too. Sadly, they ended up getting it by accident. Festus Iyayi, an award-winning Nigerian novelist, had lived in it (detention room) in 1987 or thereabouts and had written about it in a Nigerian magazine. The journalist said he had been held in custody for a month. He had not been told what crime he had committed. Neither did his colleagues and employers know that he been held. He was also involved in labour unions and recently in the campaign for Democracy organisation.